The 2019 Maid of Honor is Alyssa Fortier of Mount Carmel Academy. The competition for the 2020 Maid of Honor will take place in the fall of 2019. 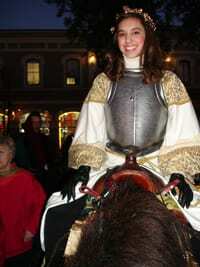 The Krewe de Jeanne d’Arc announces its annual student Joan of Arc competition for young women in New Orleans. 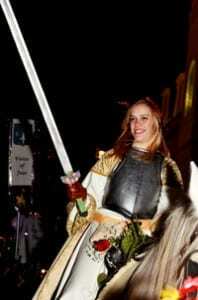 The winner will be chosen to lead the annual New Orleans St. Joan of Arc parade on January 6 in the French Quarter. This contest is modeled after the contest held annually in Orléans, France, when they select a local girl to lead their military parade celebrating Joan’s victorious lifting of the siege of Orléans from the British in 1429. Eligibility: This contest is open to young women residents of Orleans or Jefferson parishes, 16-19 years old (the ages of Joan’s most notable feats and trial), who have shown unique leadership abilities and are currently or have recently studied French in high school, college, or at home. (The candidate must be able to speak some French in conversation and be able to represent Joan for media opportunities, public presentations, and at the parade). This contest does not discriminate on the basis of race, religion, national origin, ancestry or creed. The three top candidates will receive a brief phone interview to assess French fluency, confidence and leadership abilities. THE ENTIRE APPLICATION MUST BE RECEIVED BY THIS DATE, INCLUDING RECOMMENDATION LETTER. APPLICATION CAN BE RECEIVED BY EMAIL OR SNAIL MAIL. Winner must be available to meet the krewe Monday Dec. 17, 2018, 7-9 p.m. 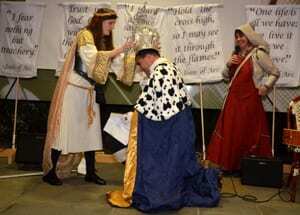 Winner must be available to ceremonially crown the king at the pre-parade banquet on Saturday January 5, 2019. 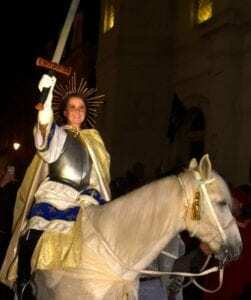 Winner must be available to lead the Krewe of Saint Joan of Arc procession at 7 p.m. on Sunday, January 6th, 2019, through the French Quarter. Winner must be available to attend at least one training/orientation session with horse trainer prior to parade. Winner must be available to attend one krewe meeting/gathering prior to parade to meet krewe members, receive costume, and prepare for the parade. · Winner must be available (pending school and other obligations) for Krewe de Jeanne d’Arc Court press conference, and any related t.v. and radio appearances. Past Maids of Honor include: Martha Pinney (2018), Heloise Trumel (2017), Margaux Schexnider (2016), Emma Martello (2015), Clara Bajeux (2014), Gretchen Neuenhaus (2013), Aggie Bell (2012), Mallory Young (2011) and Blair Davis (2010).